I'll try and explain this the best i can, given that i'm not a natural teacher, lol. ordinarily these apps would be run on the same host machine and you would use /downloads , or whatever for both apps. in the docker world, inside the container, as long as you point both apps to /downloads in their webui's etc for downloads, it makes zero difference (other than disk copying times across volumes etc) where the external folders are mapped to. So then, what it is the point of the mappings for each for download? because you have to have the mappings internally, it just makes no difference where you point them to externally. Told Sonarr to download a TV show...It found it and sent to it SABnzbd. At that point one would expect Sonarr to then go to move the file. At this point, Sonorr no longer seems to attempt to do that. Sonarr shows the TV show 100% dowloaded inside the WANTED area. Sonarr shows the TV show inside the QUEUE area. Thats it. Nothing else has happened. Now Sonarr does not try to move it after words. 15-12-6 10:13:54.1|Info|Sabnzbd|Adding report [The.Middle.S07E09.HDTV.x264-LOL] to the queue. No now Sonarr is no longer trying to get it. Interesting Enough...If I go into Activity and click on the little guy image for manual import...The TV show shows up there to be manually imported. Well would that not mean that /config would also be equal or it would not work? Right now /config for each point to other appdata directories and yet the information is stored in the right place for each program. So /config is not /config for all containers it seem each container would have it's own setting mappings...no? The Docker Guide reads... "It is important that when naming Container volumes that you specify a path that won’t conflict with already existing folders present in the container. If unfamiliar with Linux, using a prefix such as “unraid_” for the volume name is a safe bet (e.g., “/unraid_media” is a valid Container volume name)." config mapping has no bearing on this whatsoever. I posted this in the master thread, but anyway we can get support for mp4 automator built in (or maybe a second container)? Please make a issue on github. And I'll look into it tomorrow. 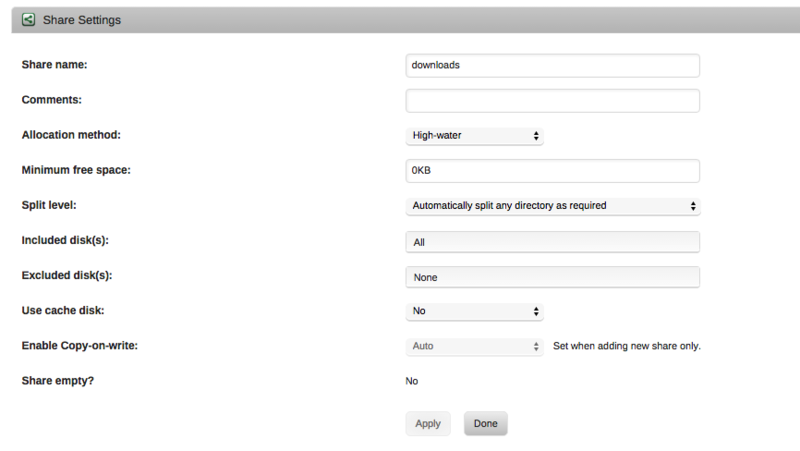 it might make sense to have NZBGet / SABnzbd support this rather than each PVR application. Ultimately I'm looking for a way to automate the remux process to help out my processor and limit transcoding requirements for Plex. Where that lives, I'm not sure I care too much (personally). i'd say more like a totally separate container for this. otherwise that's two containers have to bloat with the dependencies for this. My initial thought as well, although I'm not sure how the tie in to the post processing will work smoothly with it living in a different container. Although, it very well could be a very easy solution I'm missing... I'm anxious to see what the LinuxServer.io team comes up with. Ok, I have no idea where or how things are stored or now. I say this because even though I killed everything, including Docker itself deleting the 20G docker image file, when I did it all again, I see old directories like the original Download with the capital D.
I also see a share was made called downloads. I did not make this share. I DID create a download directory located at /mnt/cache/downloads as I set this up like referenced above. Thus I made the directory only...I did not make the share...yet it is there. With that said...Sonarr and SABnzdb are working together. How...I am not really sure. I am totally lost on the directories and the shares. So totally lost on the download share. If I go into /mnt/user/ I see all my shares normal shares but also see the file docker.img that was made on the cache drive. (20gigs and same time stamp on it as on the cache drive) and I also see a downloads folder. If I drop a file into /mnt/user/downloads/ that file does not show up in /mnt/cache/downloads. So I have no idea how this is working at all and what is needed and what is not. AUGH!!! Even the actual docker.img files shows both on the cache drive and in the the /mnt/user. Yet on the Docker setting page it shows it should be in /mnt/cache/docker.img. Are you lost? I am. Here is a good post explaining the Unraid file structure. Otherwise they'll get moved to the protected array when the mover starts..
SABnzbd downloads it to /downloads (which is mapped to /mnt/cache/downloads) then it says "Hey Sonarr, I downloaded stuff to /downloads) Sonarr then looks at /downloads (which you also mapped to mnt/cache/downloads) and says "Thanks"
Also if SABnzb had a mapping for /downloaded-stuff mapped to /mnt/cache/downloads and Sonarr had /downloaded-items also mapped to /mnt/cache/downloads then it wouldn't work either. So just making a directory automatically makes a share for it? Even if I had made that directory on the Cache drive which is not part of the array? Also, why is the 20 gig docker.img showing up in two places? Any reason why would I not want appdata to be on like drive5 only so it then is in the protected array? Well, all in all, I got it woking. Tested and all. So now I have all my shows imported in and it's waiting for tonights shows. I was totally lost with the system making user shares out of items I would place on the cache drive. Seeing that I had the cache drive set to be able to be seen, it was very confusing seeing the directories on that drive as well as being listed as directories by themselves as user shares. So now I have hidden the cache drive from showing and still have appdata and downloads showing. Now I only hope it works like it should. No reason it should not. Our containers automatically will update when they are restarted, so you don't need to do anything..
You have changed appdata and downloads to "Use cache only" right? Hummmm....I just installed it an I got 2.0.0.3580. So that in itself seems to be an issue. Just need to restart it? Does the Docker bring it down on it's own? I would think it would auto restart.